Saturday, May 20, 2017 | 4:30 p.m.
Back by popular demand, Duquesne's Mary Pappert School of Music presents its second "Summer on the Bluff" concert. 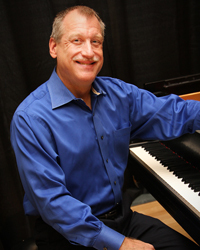 Claude Bolling's "Suite for Flute and Jazz Piano Trio" will be led by Pittsburgh Symphony Principal Flutist Lorna McGhee in her debut on the Bluff and backed up by jazz pianist Joe Utterback and Duquesne faculty Bill Purse and Tom Wendt. McGhee teams up with David Allen Wehr for Schubert's spectacular Variations on the song "Trockne Blumen," preceded by international opera star Sari Gruber singing the original song. Join us for this concert as we welcome summer back to the Bluff! Reserved Seating. Tickets on sale April 3! Summer Music on the Bluff will have reserved seating.